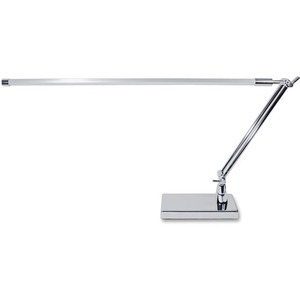 Sleek boom arm LED lamp offers weighted 7" x 4" base or mounting clamp options. Projects "warm" lighting over a large surface from a fully adjustable 26" boom arm. Uses only 6 watts of electricity and there are no bulbs to replace. Emulates natural daylight for reduced eyestrain. Produces little to no heat and contains no mercury. Lamp is rated at 30,000 plus hours.